Mustansir Zakir is a Fellow of Institute of Chartered Accountants of Pakistan, Institute of Cost and Management Accountants of Pakistan and Institute of corporate Secretaries of Pakistan. Presently working with Hashoo Group as Chief Executive. Mustansir has done his Certification in Strategic Management from Cornell University, USA, and Certified Director Education from Pakistan Institute of Corporate Governance (Accredited by RiskMetrics Group of USA). He is an Accredited Mediator & a Master Trainer from CEDR (International Dispute Resolution Centre, UK. He served as Chairman of Pakistan Hotels Association (PHA) and an Executive Member of Association of Builders and Developers of Pakistan (ABAD). Anwar Kashif Mumtaz Advocate High Court is a Senior Partner of M/s. Saiduddin & Co., a Tax and Corporate Law Firm in Pakistan. He is a Certified International Trainer on Leadership & Personal Development and also CEDR accredited Master Trainer. He has served as a Secretary General, Vice President and President of Karachi Tax Bar and Secretary General of Pakistan Tax Bar. Presently he is President of Pakistan Mediator’s Association. He is also an Executive Committee Member of Public Interest Law Association of Pakistan (PILAP). Ayesha is an Accredited Mediator and Master Trainer, her work in mediation and training spans across 9 years. 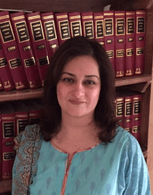 Her mediation portfolio includes training and assessment of Judges of the Punjab High Court, the Citizens Police Liaison Committee (CPLC), Additional and District Court Judges of Sindh and Baluchistan, Lawyers, Federal Ombudsmen and Corporate Management. She has jointly set up an international inspection company and is a Vice President of the Pakistan Mediators Association. Barrister Ayesha is a graduate of Durham University (U.K.) holding an LL.B (Hons) and is a member of the Honorable Society of Gray’s Inn. She is in practice since 1993. Worked with AGHS Legal Aid Cell/AGHS Law Associates, Mrs. Asma Jehangir & Ms. Hina Jilani, M/s Surridge & Beecheno. Currently she is Managing Partner in M/s Sheikh Shah Rana & Ijaz (SSR&I), handles the corporate & consulting, in charge of drafting & vetting in corporate & commercial matters. She has also registered Charitable Trusts and Partnership firms. She is an Accredited Trainer of the Advocacy Training Programme Pakistan under the aegis of the Inns of Court Advocacy Committee (IATC) of the Bar Council of England & Wales & an accredited Mediator & master Trainer (CEDR) UK. She is member of various Bars of Punjab. She has been twice awarded gold medals for merit in studies from her Alma Mater, the Punjab Law College. He is a Senior Partner at S&K Partnership, done his Barrister-at-Law (Lincoln’s Inn, London) Accredited Mediator & Master Trainer (CEDR, UK), Member of Chartered Institute of Arbitrators, London, MCIArb. Post-Graduate Diploma in Professional Legal Skills (UK), LL.B (Hons) (UK), B.A & M.A (Pakistan). Attended various training nationally & internationally. Isfandyar is currently serving as Vice-President of PMA. Prior to joining IFC/world Bank he worked at UN as intern, UNDP Project, Aurat Publication & Information Services Foundation at law firm, Afridi, Shah and Minallah. Isfandyar is Patron Member of PRCS, Life Member of Hull University Students Union, Pakistan Environmental Law Association & British Alumni Association. He is Alumni of Good enough College, London. He is a mediator, an international ADR Trainer, an Advocate of the Supreme Court and partner at Abraham & Sarwana. He is a CEDR Global Panelist and Co-chairs the International Bar Association. He co-founded CDRC IBA-VIAC Mediation and Negotiation Competition, Austria. He served on IMI’s Task Force to Develop Best Practice Guidelines for Mediator Training & International Chamber of Commerce (ICC’s). Conducted mediation accreditation courses & workshops around the globe for (IRC). He has judged ICC International Commercial Mediation Competitions in France. He has authored chapters on negotiation and mediation in IBA, ICC and American Bar Association (ABA) publications. She is Company Secretary & General Counsel of HBL & also a Director of First Women Bank Ltd. Started her legal practice with Surridge & Beecheno after being called to the Bar from Grays Inn London. Ms. Ahmad has an LLM from the University of London & LLB & philosophy of religion (AKC) from Kings College London. She worked as in house legal counsel with ICI Pakistan Ltd, Unilever Pakistan Ltd & Pakistan Petroleum Ltd. She has been Non-Executive Director of the Central Depository Company, task force on Corporate Governance of Karachi Stock Exchange & Overseas Chamber of Commerce & Industry. She is on legal & regulatory committees of Pakistan Bank Association & Pakistan Business Council. Accredited Mediator & Master Trainer by (CEDR) UK. She is a Certified Director – PICG/ Risk Metrics, USA, & a Master Trainer & Mediator accredited by CEDR UK. She is Mechanical Engineer, subsequently diversified as a Corporate Secretary, She holds diversified experience in banking, training & organizational development, and corporate affairs, with special focus on Corporate Governance. She is visiting faculty for “Corporate governance leadership program” and “Bank Governance” for Company directors and executives, currently she is employed with State Bank of Pakistan as Director SCAD/ Corporate Secretary SBP. Her previous experience involve working as group Company Secretary of International Industries Ltd, Company Secretary (NIT), First Women Bank & (IDBP). Saima did her LLM from Kings College London. Her initial experience was in corporate and constitutional litigation, which subsequently expanded to transactional work and consultancy relating to legal reforms and development. She has received special training in Environment laws from M.C Metha Foundation Rishkish, India. She has also been trained in mediation and is an accredited mediator. She has taught various subjects at TILS, UCL, LUMS, Civil Services Academy and the Judicial Academy. She has been an amicus and part of many commissions at the High Court, presently part of the Climate Change Commission constituted by the Lahore High Court. He is an MBA and a Civil engineer by profession. He is an accredited Mediator and Master Trainer from CEDR (UK). He is also a founder member of Karachi Centre for Dispute Resolution. Since his accreditation in 2006, Khoja has conducted various mediations and has also led over a 100 International and local trainings in Mediation and conflict resolution.. He is a regular participant in international moots like CDRC Vienna and ICC competition in Paris. He is also on the panel of international Master Trainers for International Conciliation and Arbitration Board. He is the Vice Chairman of the Aga Khan Foundation Pakistan. He is also a director of the Aga Khan Rural Support Program and Pakistan Centre for Philanthropy. He was called to the bar by the Society of the Lincoln’s Inn, UK. Have LL.M. (UK) in Commercial Laws, P.G.Dip in law (UK), LL.B. (Pak) and holds a qualification of Associate Engineering (Mech, Pak). In addition to being a consultant, he is an Accredited Mediator & a, Master Trainer from CEDR (UK). As a Partner of law firm Surridge & Beecheno, heads the Corporate & Commercial Laws. He is also a trainer at the Directors Training Programme. He is a member of the General Council of the Bar of England & Wales, UK, The Society of Lincoln’s Inn, London, UK, Ex. member management committee of the Hillingdon Law Center, Hayes, Middlesex, UK, VP PMA, Punjab Bar Council, Lahore High Court Bar and District Bar Lahore, Lahore Chamber of Commerce & Industries. Usman did his LL.B. (Hons.) from University of London, LL.M. from King’s College, University of London & Bar Vocational Course from University of West of England, Bristol, U.K. He was called to the Bar by the Hon’able Society of Lincoln’s Inn. Barrister-at-Law Advocate of the High Courts, Accredited Mediator & Master Trainer by (CEDR) UK. Usman started his professional career by joining ‘Umar Bandial & Associate’ thereafter he runs his legal practice as ‘Inayatullah Chambers, Advocates & Legal Consultants. He is also a certified ‘Advocacy Trainer’. He teaching ‘Company Law’ and ‘Law of Evidence’ to LL.B. London University (External Programme) in University College Lahore. Usman engaged in various Students’ Executive Committee of the Hon’ble Society of Lincoln’s. He is a Senior Partner practicing since 1986. He is an Accredited Mediator & a Master Trainer from CEDR –UK. From USA got training in Mediation, Case Management & other ADR Mechanisms, developing ADR Curriculum in Advocacy Training Skills (Bar of England & Wales), Training on Human Rights & Criminal Justice Process College of England & Wales. He is on the panel of Mediators of Lahore Chamber of Commerce (LCCCI) Mediation Centre and a Mediator & Arbitrator at Center for International Investment and Commercial Arbitration (CIICA). President of Lahore Bar Association (1996-97). Member Punjab Bar Council, (2000-05), Presently Vice President PMA. He is trainings & teaching to different college & institutions. Visited USA on exchange programs to study the USA legal system. He attended Seminars, Workshops & Conferences nationally & internationally.